It’s time again for the 2018 Teddy Bear Toss for McLean County Toys for Tots! 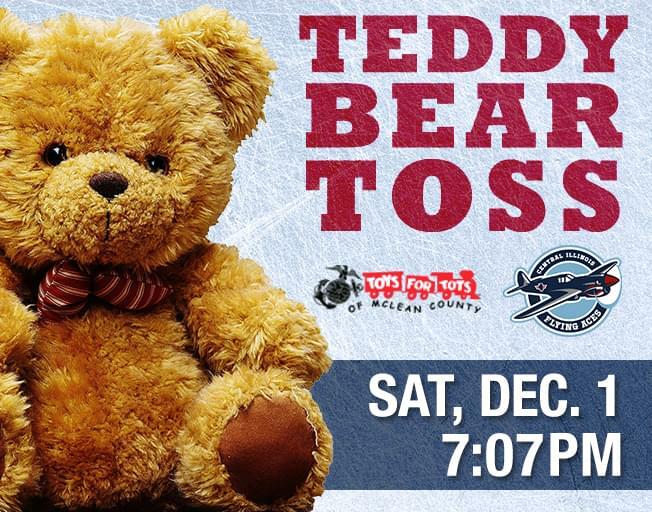 Come out and cheer on the Central Illinois Flying Aces on Saturday, December 1st AND bring your new, unwrapped teddy bear for the kids of McLean County Toys For Tots! When the Flying Aces score their first goal, everyone can throw their teddy bears onto the ice to be donated to Toys for Tots. We want to make sure every kids gets a special Christmas this year, but we can’t do it without your help, and the Teddy Bear Toss!